Maserati has restyled its Quattroporte and honed the engine range. The restyled Quattroporte features a new bumper design with matte black profile at the front and the matte black extractor at the rear. The front grille is more pointed and introduces new vertical chrome elements that contrast with the 'deepness of the shark nose effect'. Other distinguishing details include the matte black side skirts and the exterior mirrors, which have been slightly restyled to incorporate new technical elements. An electrically adjustable Air Shutter has been fitted in the front grille between the air vents and the engine’s radiator. The Air Shutter provides optimal control of the engine’s fluid temperature and, together with the optimisation of the new front and rear bumpers, air conveyor and flat bottom, improves the aerodynamic drag of the car by 10%. A redesigned central dashboard with integration of the new multi touch 8.4” screen are part of a continuous technical element which now integrates the screen, new climate control and new drawer in a single seamless design. The central, lower console has also been redesigned and now features a rotary knob for volume and function control. A new package of Advanced Driver Assistance Systems includes Adaptive Cruise Control with Stop&Go, Lane Departure Warning, Forward Collision Warning with Advanced Brake Assist and Automated Emergency Braking. All Quattroporte models are now equipped with an Air Quality Sensor, a system that combines a sensor and a signal analysis system that calculates the external pollution levels and prevents polluted air and toxic gases from entering the cabin. With the restyling of the flagship Quattroporte, Maserati is launching a new range strategy with two ‘highly distinctive’ trims - GranLusso and GranSport - available as an upgrade for all Quattroporte V6 powertrain versions (Quattroporte Diesel, Quattroporte, Quattroporte S, Quattroporte S Q4). Both trims will be priced at the same level across the range. GranLusso models feature a new front lower fascia design with a floating bridge element and a delicate spoiler, detailed by the chrome bumper finish and the body colour bumper profiles. The profile incorporates side skirts, while on the rear the look is even cleaner, says Maserati, characterised by a sculptured ‘retroreflector’ and a body coloured spoiler. The exterior look is completed by 20” Mercurio rims and black painted brake calipers. In the cabin, an Ermenegildo Zegna Edition interior features a patented silk fabric on the seats, doors, headliner and sun visors. The cabin ambience is further refined by exclusive Radica wood on the dashboard and the leather steering wheel with wooden inserts. The trim integrates comfort-oriented equipment like the power foot pedals, the electric rear sunblind, the four-zone air conditioning, the heated rear seat and the extended keyless entry. At the front of the Quattroporte GranSport, a dedicated restyling for the centre and side air intakes improves the cooling function while showcasing an ‘aggressive’ front end - underscoring the sporty character of the Quattroporte while enhancing the aggressive appearance of the car. The lower fascia is linked to the grille with aerodynamic inspired splits. The back features a rear diffuser that connects the twin exhausts while an aggressive black piano spoiler completes the rear view. 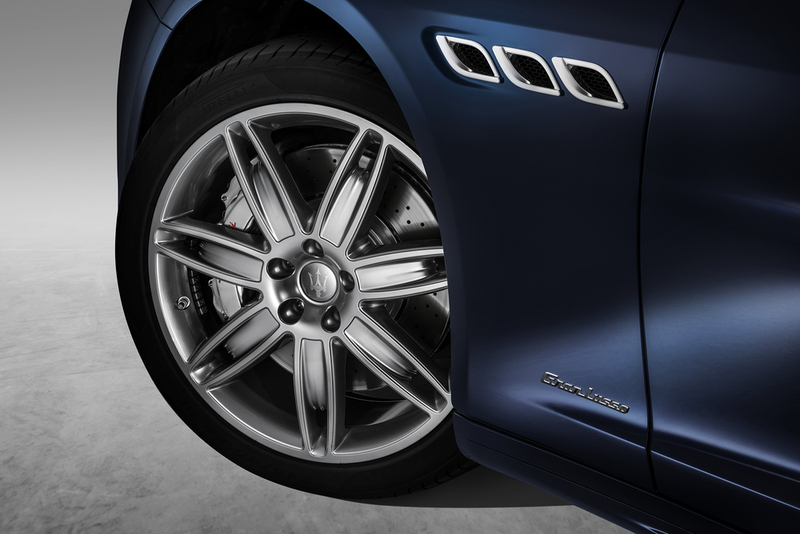 The Quattroporte GranSport is fitted with 21” Titano rims and features a glossy black finish on the bumpers, red brake calipers with blue inserts in the front Trident and side Saetta badge as well as blue Tridents on the wheel centres. As an option, the front grille of the GranSport can be ordered in a glossy black finish. The interior of the GranSport includes redesigned front and rear seats for an improve sporty driving performance while a new sport steering wheel, in carbon fibre or full leather is joined by high gloss Piano Black wood trim on the dashboard, aluminium gearbox paddles and the stainless steel sport pedals for a 'truly sporty experience’. A very wide range of engines and transmissions are available. The entry-level petrol is now available with 350 hp, 20 hp more than in the previous version, and is capable of delivering 500 Nm of torque of for a 0 to 62mph time of 5.5 seconds and now has a higher top speed of 168mph. The Quattroporte is also available with the 410 hp 3.0 litre Ferrari-produced V6 Twin-Turbo, with rear wheel drive (Quattroporte S) or with Q4 - the all-wheel-drive system available for the Quattroporte S Q4. At the top of the class for both versions are the 550 Nm of torque and the 178mph top speed, with the S Q4 variant accelerating from 0-62mph in 4.9 seconds and the rear-wheel drive Quattroporte S version in 5.1 seconds. The Quattroporte GTS is powered by a 530 hp, 3.8 litre Ferrari-produced V8 Twin-Turbo, capable of a peak torque of 710 Nm and able to propel the car to 193mph, accelerating from 0 to 62mph in 4.7 seconds. The Quattroporte Diesel available is a 3.0-litre V6 Turbo unit, delivering 600 Nm of torque with 275 hp, retaining a top speed of 156mph and a quick 0-62mph figure of just 6.4 seconds. All versions of the Quattroporte are fitted with the ZF eight-speed automatic transmission and electronically-controlled Skyhook shock absorbers; with an ideal 50:50 weight distribution and an extensive use of aluminium in the chassis, body and suspension, performance and comfort are described as 'unparalleled'. The revised Maserati Quattroporte is available to order now.